One solution to old cars that are designed without very big people in mind is a smaller, replacement mini steering wheel. We sold them for many years, from 1988-2006, and we loved them! Even with the tilt-wheel or telescoping column option, many cars have too little space behind the wheel for some of us. 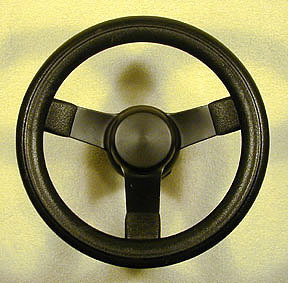 However, after the invention of the airbag, fewer and fewer customers were able to use this wheel—sadly, it only fits cars without an airbag, which means old cars sold in the U.S. before 1991-93, depending on model. Due to diminished volume, we no longer carry the wheel, but if you have an old car without an airbag in the steering wheel, you can still order it elsewhere. How can you tell if you would be helped by the wheel? The average steering wheel is 15" across. This wheel is about 10" across and has a 3" shallow "dish", which is 1" shallower than most standard steering wheels. This places the rim of the wheel about 1" farther from your chest, and about 3" farther in your stomach/thigh area closest to the wheel, when compared with standard wheels. Installation can be done by most do-it-yourselfers. Takes less than 2 hours. Or have your mechanic install it. Comes with instructions. Color: black. Power steering required. Adapter kit required for your make and model of car. These wheels cannot be legally used to replace a wheel that has an airbag. For such cars, you need to have the seat moved back a few inches, and if you have trouble reaching the pedals, then have pedal blocks installed. This work can only be done by a federally-licensed facility, but in most cities, there are shops set up to perform "van conversions" for people with special needs, and they are equipped to do such work legally. Go to the website http://www.grantproducts.com. They are the manufacturer. Enter their website and do a search for the model 850 wheel. The search form is at the bottom of their home page. Do a search for the right adapter kit for your make and model of car. If you intend to install the wheel yourself, you can only do it safely with a wheel puller. Grant makes the cheapest one in the industry. Find an auto parts distributor who can order the right parts for you. You will need a wheel, an adapter kit, and probably a wheel puller. Click on the "Where to Buy" button on the Grant home page. There are a list of online stores to order Grant products. You may also be able to order the parts from your local auto parts store, and it might only take 2-3 days. If you intend to have a mechanic install your wheel, we suggest that instead of ordering the parts yourself in Step (5), give your mechanic the part numbers for the wheel and the adapter kit, along with the brand name (Grant Products), and ask him or her to order it for you. Your mechanic has access to parts suppliers who can get these items, and he or she will have more incentive to do the job for you if they make a little money on sale of the parts as well as labor for the installation. Plus, if there is any irregularity about fitting the parts to your car, they would be better able to deal with the parts supplier than you would. In the end, you won't save much by buying the parts yourself and handing them to your mechanic. They hate it when you do that! We have no advice on where is the best place to buy the wheel, and we receive no commission for steering wheel sales or referrals. We just want our customers to know how to buy a product they can no longer get from us!